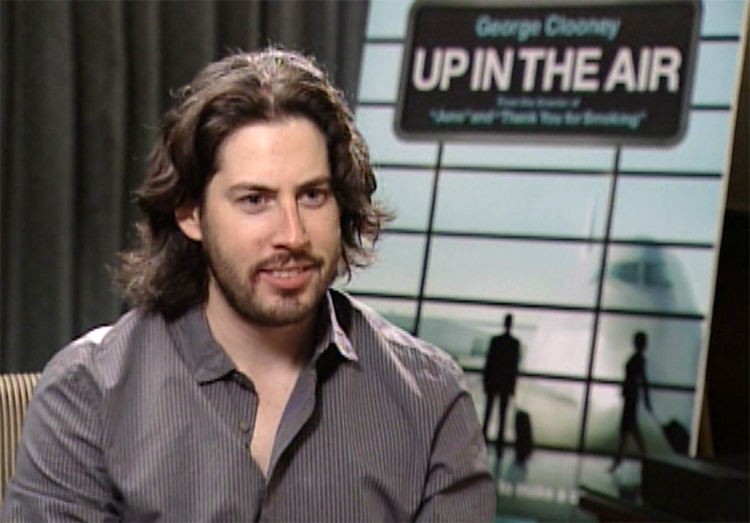 In his latest movie, Up In The Air director Jason Reitman made a good decision. Rather than hiring actors to play the recently unemployed, Reitman chose to recruit the recently laid off to re-live the moment the hatchet fell. (This link has a great interview with him that talks about what i’m talking about.) One of these grass roots ‘actresses’ is Kelly Bertha. Since beginning Booze Revooze, i’ve enjoyed writing about “Silken Butterflies”: those little known actresses that stand out for me, despite the brevity of their flitting appearances across the screen. In my notes to Up In The Air, i scribbled “1st unemployed girl, blue eyed f*ck” because the first woman shown being laid off has these blue eyes that wars have been won over and she uses the ‘F’ word in a totally appropriate situation. While looking for pictures of her on the web, i came across her contact info and asked her for an exclusive interview, to which she graciously obliged. What follows is the e-mail interview i conducted with her about her experiences. Where are you from & where do you live now? Many, but none I’d like to share! I read that Jason Reitman put an ad in newspapers saying he was making a documentary about unemployment and put out a call for unemployed people. Is that how you got involved in Up In The Air? A Headhunter actually told me about the opportunity. I sent in a pic and how I was fired, and was then contacted by a casting director. The rest is history. What was the interview like? Why do you think you were one of the 25% he chose to keep for the film? I went through a series of on-camera reads (auditions) with various casting/production staff. I have absolutely no idea how or why I was chosen for the film. Well, maybe it was my huge rack (kidding), but my rationale is that I represented the younger, female, middle-class Caucasian population of America, based on the demographics selected for the film. Filming was surreal. Lots of lights, cameras, people behind screens looking at you though monitors… just like you see on a film set, but it’s happening to you. The Director/Producer is sitting across the table “firing” me, and I was asked to react to specific situations. There was no script. All improv. What you see in the film are the reactions to what the Director/Producer was saying to us. Unedited. The final shoot literally took 5 takes, and I was finished. You’re a member of the Screen Actors Guild now, right? If we pay the membership dues, I’m told we can be SAG members. Did you see the movie in the theater after the release? Who did you go with? There was a cast/crew screening before the movie hit theaters. Jason Reitman and some of the Producers were in attendance as well. I read one article that said Reitman exploited the unemployed ‘actors’ used in this movie. What’s your reaction to that? So, overall, what’s your take on your film experience? I will have to scratch off “making my motion picture debut in an Oscar nominated film with George Clooney” off my bucket list. I would do it again in a heartbeat. What’s your educational / professional background? 9+ years of Marketing/Sales experience within a Fortune 10 company. Have you had any success finding a new position? Do you have any advice for people who are currently job seekers? Network, Network, Network. Just applying to jobs online will not get you a job. If someone reading this is interested in hiring you, what’s the best way to get into contact with you? They can contact you, and you can contact me. Do you have a few words for your many fans? I don’t think being in a movie for 15 seconds classifies me as having a fan base, but ok. Finally, for The Bar None, i gotta ask…What’s your favorite alcoholic drink? If you think that Ms Bertha is what you’re company needs, you’re wrong. She Is EXACTLY what your company needs. Hire her. Now. You’d be lucky to have her. If i’m wrong, you won’t even have to sue me, i’ll give you your money back. Before signing off, i’d like to thank Ms Bertha for going out on a limb and agreeing to this interview. i’d also like to wish her the best of luck in her future. She’s intelligent, well-spoken, and witty. Every contact i’ve had with her has been very professional and she would be a perfect addition to any team. This entry was posted in Booze Revooze: A Drinker's Skewed View, Booze Talkin': Exclusive Interviews and tagged Booze Revooze, Interview, Jason Reitman, Kelly Bertha, Kelly Bertha Interview, Movie Reviews, Silken Butterflies, The Booze Talkin', Up In The Air. Bookmark the permalink. i just shot off Meagan’s interview to her and hopefully i’ll wrap yours up soon as well; i’d like to send it before i go to bed and it’s already after 11pm here in Yeman. Keep your eyes peeled and your drink cold! That must have been such a great experience! I love to know these kinds of behind-the-scenes stories about films. It makes for a good story, so I am glad Kelly Bertha agreed to do this. I’m off to read Meagan’s! i’m glad she agreed, too. It woulda been hard to do this interview without her. Congrats on the speaker thing! The song is Sad Brad Smith’s “Help Yourself” and i’ve included the info at the top of the post. My reasoning for leaving it out was that i’d included it in the review of UITA along with the info and didn’t want to be redundant; but you’re right, it’s more professional (and cooler for Sad Brad Smith) if i list the details. Hey Al she had the same affect on me. I immediately looked up her name on the “Up in the Air” IMb website. Too bad there arent more pictures of her. I think her eyes are green though. Welcome to The Bar None, brother. Come on in and make yourself at home. What can i get you to drink? Funny how we both singled her out from all the other unemployment victims getting handed their notices. You have a good eye and good taste, just don’t go anywhere near Miss Demeanor (lol). i agree with you as well about the lack of photos on the Net. Course she is a professional type and not an actress, so that pro’lly explains it. i asked her for some photos when i did the interview, but i guess she didn’t feel comfortable sharing. Knowing me the way i do, i can’t say as i blame her. Hmm, funny about the eyes. i coulda swore they were blue, and she didn’t correct me when i sent her the final draft of the interview for her approval. Can we agree on Blue/Green? Yeah i was able to contact her through her Facebook page and i did use her Facebook photo in the original review of the movie (https://pjensi.wordpress.com/2010/01/31/booze-revooze-a-drinkers-skewed-view-of-up-in-the-air/). However, she didn’t send me any pictures of herself to use for the interview, so what you see it what i couldn’t get. I worked with Kelly at that Fortune something or other company. She was great. The inflated gasbag ego suit she worked for – not so much. Thanks for stopping by Beer Hound or Bar Maid. Have a seat, put your feet up on the table and what can i get you to drink? i appreciated getting a note on this post! i never met Kelly but i enjoyed my contact with her and it’s nice to have confirmation concerning what i already suspected: that she was Great. Never met her boss but i loved the expression “ego suit” and will use it as often as i can. Thanks also for the subscription. Don’t be afraid to unsubscribe if it gets too hot in the Bar None, i’ll totally understand.